I didn’t use my cell phone to take a picture because that would just be rude – but I did sketch it up for you. See how that powder bath door opens up into the front hall right off the main entry? Homeowner: Hi! Welcome to our house – sorry about the odor, Teddy’s not feeling too well. Eventually you’ll come to love the smell of #2 and aerosol roses. We find that it’s earthy. Homeowner: Howdy! Welcome to our home. If you need to use the toilet – it’s right here located in a place where we will all see when you go in and when you come out. Also, we can hear everything since the sitting room is right here so please make sure you wash your hands – we’ll know if you didn’t. We had to switch out the quiet fan for one that made some noise to help the illusion of privacy but if you are going to be in there doing some serious business, you might want to consider leaving and going to your own home. Can’t you see that this is a mistake under all circumstances? Of course you can … so why am I starting to see this showing up in plans again? Having a toilet room by the front door is not the problem – it’s how you access it. I generally think that the “Master’s” of the house will not be the ones using this toilet. It probably won’t be the kids either – this one is for guests. At the very least, create some sort of procession or privacy to the path accessing this room. 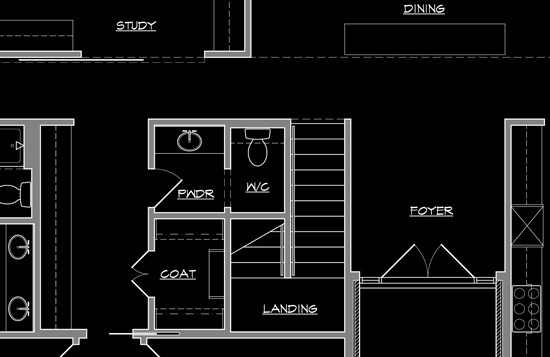 The picture above is a layout for the weekend home that I drew up – it has a very open floor plan and there wasn’t a location suitable for placing the toilet by the entry. Instead, I broke up the classic pairing of coat closet and toilet room and placed them at opposite ends of the entry hallway. 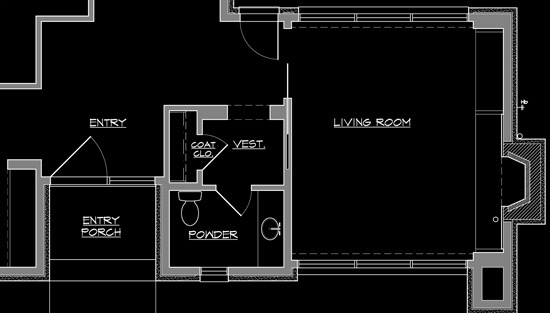 The coat closet is located off to the side of the main entry with the toilet room at the other end of that same hallway. This makes it easy to find,(i.e. easy to give directions to your guests on where to find it) – but doesn’t put it in a place where everyone can see when you enter and leave the room. See? That’s called privacy and everyone using the toilet wants it. I thought I would include some examples from my office where the client really wanted a toilet by the front door – which I can understand. It’s generally part of the public zone and you would like guests to be able to use it without having to cross over into the “private” zone (i.e. pass bedrooms and the sort to get there). In these instances, we go to great lengths to not have the door visible from the main room that is almost always right off the front door. 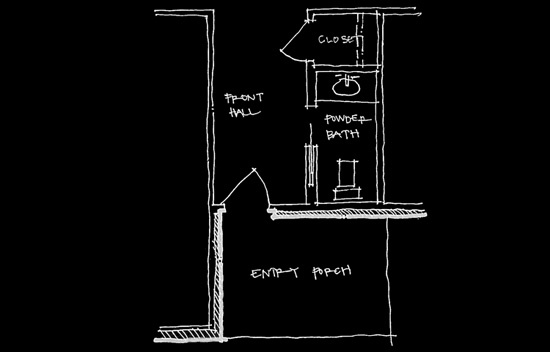 The example above is just a few steps away and has a hidden panel that covers the shower so that the room feels more like a powder bathroom rather than a full bathroom. At the end of this hall is the workout room and that’s why there is a shower here. 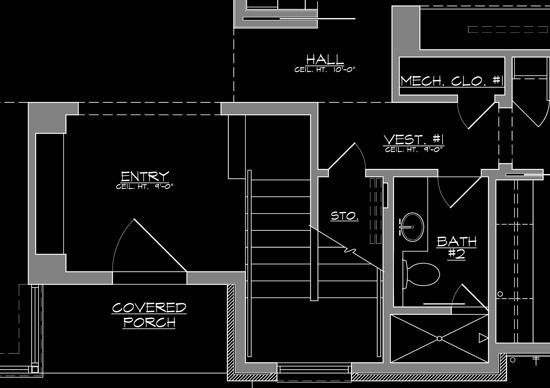 In this example, the entire coat closet / toilet room block is around the corner. It’s not to tricky to find, but once again, there isn’t a line of sight from anywhere into the toilet room. In this final example, we created a processional type space that contains the coat closet and is then followed by the toilet room. For those of you that have read this site before, you might recognize the modern toilet room layout. I am particularly fond of this layout because the coat closet and toilet room still have a traditional relationship to one another yet the space containing the coat closet acts as a visual and acoustical buffer to the room beyond. I also like that the door opens in such a manner that the gracious counter and sink are presented when the door is opened (not the toilet) and should you forget to lock the door upon entering, the door will screen the person who is currently using these facilities. And seriously, who wouldn’t appreciate that? It appears that this is making a come-back and I am not very happy about. Placing toilets by the front door is a terrible idea unless it is handled properly – and by properly I mean not by the front door.